The Grand Final of Choir of the Year took place in Southbank Centre’s Royal Festival Hall on 28th October 2012. The event was recorded for later broadcast on both BBC Radio 3 and TV channel BBC Four, with compères Tim Rhys-Evans and Josie D’Arby. The winners on the day were Les Sirènes, a ladies’ choir made up of past and present students of the Royal Scottish Academy of Music, but the judges commented that all the choirs were very close, with only five marks separating them. Although disappointed not to have taken the overall title of Choir of the Year, Surrey Hills Chamber Choir were very pleased to see the local media pick up on their success in reaching the Grand Final. Online newspaper the <a title=”Article on Guildford Dragon” href=”http://www.guildford-dragon.com/2012/10/30/local-choir-pipped-at-the-post-for-choir-of-the-year-title/” target=”_blank”><em>Guildford Dragon</em></a> talked about our “real stage presence” and a performance that “brought the house down”. 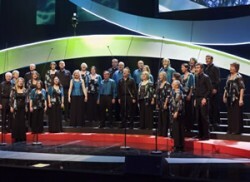 The <a title=”Article on Get Surrey website” href=”http://www.getsurrey.co.uk/entertainment/s/2123285_surrey_hills_chamber_choir_misses_out_on_bbc_award” target=”_blank”><em>Get Surrey</em></a> website observed that the eventual winners of the title, Les Sirènes, were “a wild card winner at the category finals, where … Surrey Hills Chamber Choir actually beat them to be named the adult choir of the year 2012”. We can only imagine what would have happened if we had won!